Made up of the 14 hilly districts of former Uttar Pradesh, Uttaranchal tour reveals the state's richness of flora and fauna and some of the most important pilgrimage centers in the country. Most of the districts of Uttaranchal are a part of the Himalayan ranges. At 7,817 m above sea level, Nanda Devi peak in Chamoli is the highest point in the state. The region has many glaciers, passes, meadows, and trekking routes with several major rivers like the Ganga and Yamuna originating from the state. A major part of this state is covered with rainforests and alpine forests that are the dwelling places for some of the highly endangered wildlife species. The adventure seekers can find solace in trekking, mountaineering, hiking, high- and low-altitude trekking, river rafting, para gliding, hang-gliding, skiing, and many others. The nature and wildlife lovers can visit the Jim Corbett National Park, the haven of Royal Bengal Tigers. Rajaji National Park is famous for its large number of pachyderms. Alpine forests in the region include Valley of Flowers National Park (known for its amazing variety of flowers), Nanda Devi National Park, Govind National Park, Gangotri National Park, and many more. A Tour to Uttaranchal is full of pilgrims like Gangotri, Yamunotri, Kedarnath and Badrinath. 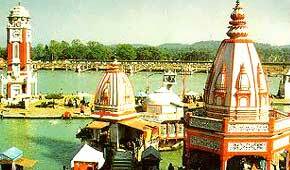 If you go to Rishikesh and Haridwar; it completes your Char Dham yatra, one of the four famous Hindu pilgrimages. The hill stations like Auli, Haridwar, Musoorie and Rishikesh offer you liberty from the extreme northern heat wave while your tour to Uttatranchal. Garhwal was formed in the 15th century, when king Ajai Pal merged the 52 separate principalities, each with its own fortress. For 300 years, Garhwal remained one kingdom, with its capital at Srinagar (not to be confused with the capital of Kashmir). The early medieval history of Kumaon is the history of the Katyuri dynasty. The Katyuri kings ruled from the 7th-11th century over large areas of Kumaon, Garhwal, and western Nepal. Temple building flourished under the Katyuris with their main architectural innovation being the replacement of bricks with hewn stone. Be it nature, wildlife, adventure, and pilgrimage tourism; the Uttaranchal tour has immense opportunities for the tourists. The major tourist destinations in the state are Haridwar, Rishikesh, Dehradun, Mussoorie, Almora, Kedarnath, Badrinath, Yamunotri, Gangotri, Jim Corbett National Park, Nainital, Ranikhet, and Pithoragarh. 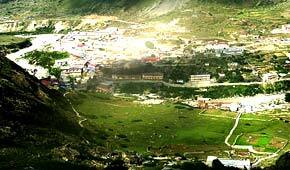 The name of the town Badrinath was derived from the Badri Van, where the lush green Badri trees grow heavily. One of the Char Dham pilgrim centers for the Hindus; millions of tourists throng Badrinath every year. The Corbett National Park set up in 1936 is India's first national park. The great hunter Jim Corbett established the Corbett National Park. The park spans across some 920.9 square km at an altitude of 600 to 1100 metres about the foothills of the western Himalayas in the districts of Nainital and Pauri Garhwal in the state of Uttaranchal (formerly part of Uttar Pradesh). It includes the Sonanadi Wildlife Sanctuary as a part of its 1,319 sq km of reserved forest area. Gangotri is an ideal location to satiate your spiritual as well as adventurous motives. Gangotri, the origin of the sacred river Ganges, attracts numerous tourists with its mystical aura that India is quite famous for. The Garhwal Himalayas nestle one of the holiest Hindu pilgrimage sites - Yamunotri. One of the Char Dhams according to Hindu mythology, Yamunotri is the origin of the sacred river Yamuna and is famous for its thermal springs and glaciers. Haridwar or 'the Gateway to the Gods' is one of the seven holiest places according to Hindu mythology. Referred to as Mayapuri, Gangadwar and Mokshadwar in the ancient scriptures and epics; Haridwar has always remained a major pilgrimage for the Hindus in INdia. The Garhwal region of north India is speckled with some of the holiest of Hindu pilgrimage sites and Rishikesh is one such major tourist attractions. Rishikesh is the birthplace of yoga, which attracts thousands of tourists every year. It is also an attraction for the ones in search of adventure and passion. The major dance forms of the Garhwal region are Langvir Nritya, Barada Nati folk dance, Pandava Nritya, Dhurang, and Dhuring. The Kumaonese are also fond of music, folk dance, and songs accompanied by local musical instruments like murli, bina, and hurka. The dancer known as "hurkiyari," who is usually his wife or daughter, accompanies the hurka, played by the "jurkiya". They go from place to place narrating folklores, singing the praise of their gods and goddesses. During fairs and festivals and at harvest time, the Kumaonese often dance the Jharva, Chandhur Chhapalior, and many other forms of folk dances. The popular folk songs are Malushahi, Bair, and Hurkiya Bol. The major fairs and festivals of the Garhwal region are Hatkalika Fair, Tapkeshwar Fair, Surkhanda Devi Mela, Kunjapuri Fair, Lakhawar Village Fair, and Mata Murti Ka Mela; and of Kumaon region are Uttarayani Mela, Shravan Mela (Jageshwar), Kartik Poornima at Dwarahat, Kasar Devi fair, and Nanda Devi melas. Jolly Grant near Dehradun is the only airport in the state of Uttaranchal. There are regular flights to Delhi from this airport. Dehradun, Haridwar, and Kathgodam are the major railway stations connected to various places in India with regular trains. Regular bus services connect Delhi and other major cities in North India with Dehradun. For those visiting places in the higher altitudes, trekking and roadways are the only available routes. Sometimes some routes are closed due to landslides and heavy snowfall.